Karnataka has acquired a name for itself in recent times for decentralization, local governance and improvements in the social sectors. The State is also known for land reforms and the political assertion of backward castes, influenced by Lohiates, and all these have impacted agrarian life in rural Karnataka. However, the contribution of agriculture and allied activities to the State’s income has been steadily falling. Villages often remain as a place of habitation, blurring the conceptual distinction between villages and cities. The recent agrarian protests across India notwithstanding, studies claim that we have arrived at a ‘post-agrarian’ situation exemplified as ‘rurban’ lifestyle. While the various elaborate surveys, including the NSSO led Situation Assessment Survey of Farmers (SAS), offer insights into the broad socio-economic condition of agricultural households, they don’t provide a deeper understanding on the condition of farmers, farming and changing agrarian relations in Indian villages. It is a yawning gap that can be filled only by micro level studies. 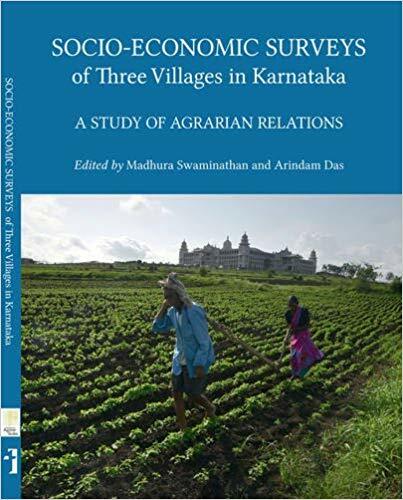 It is in this context that the contribution of this book edited by Madhura Swaminathan and Arindam Das, rather a field report, assumes significance in understanding the complexities and dynamics of agrarian transformation in the country, particularly Karnataka. We seldom come across a work that offers a comprehensive understanding on land, labour and caste relations together. Since the book under review does exactly that, it is a timely intervention. The report is a product of a larger ‘Project on Agrarian Relations in India’ (PARI) by the Foundation for Agrarian Studies, which has already covered 25 villages in 10 States of India. The stated objectives of PARI include studying ‘village-level production, production systems and livelihoods, and the socio-economic characteristics of different strata of the rural population by means of detailed village surveys’. This report was based on a survey of three villages, one from each of the three regions in Karnataka. One is Alabujanahalli in Mandya district, a Cauvery irrigated region of southern Karnatataka, the second one is Siresandra in Kolar district, a semi-dry and rainfed region of south-eastern Karntaka and the third is Zhapur in Gulbarga district, a dry region of northern Karnataka. Thus the report offers an insight into the sub-regional variation in the nature of agrarian transformation within the State. The report is divided into 13 chapters. After a brief discussion of the PARI and the selection of villages in the preface, the first chapter discusses the agrarian economy of the State at the macro level, including tenancy reforms, and offers an historical overview of the State. The following chapter offers an introduction to the villages. The chapter on ‘Socio-Economic Classes in the Three Villages’ by VK Ramachandran provides a template to understand or do a class analysis in rural India. It offers comprehensive understanding into the meaning, method and definition to the class differentiation. The class analysis that follows moves to the distribution and inequality of land and other issues like asset, income and tenancy relations in the three villages. A unique feature of these surveys is the estimation of household incomes based on detailed data on income from agricultural and non-agricultural sources. To understand asset ownership, ‘Landholding and Irrigation in the Study Villages’ has to be read along with ‘Features of Asset Ownership in the Three Study Villages’. The analysis of asset distribution shows gross inequalities among the three villages due to caste and class differences. While land is the predominant asset, the asset ownership includes animals, means of production and means of transport. Among the three villages, Zhapur displays extreme inequalities in all aspects. Landless households constitute about 45% in the village, compared to 18.1% in Alabujanahalli and 11.4% in Siresandra. The Gini ratios are 0.76, 0.63 and 0.55 respectively. As expected, inequalities are typically shaped by caste. The landless among Dalits constitute about 54% in Zhapur, 31% in Alabujanahalli and 24% in Siresandra. Only Zhapur has a tribal population whose condition is worse than that of Dalits, about 71% of whom are landless. Following the pattern of land holding, Zhapur tops the list in the inequality in assets also. The richest 10% of households account for 67% of total assets in Zhapur and the poorer 60% hold only 8.9%. While the richest 10% of households account for 50% of total assets in Alabujanahalli the poorer 60% hold only 14% of the assets. The corresponding figures for Siresandra are 38% and 20% respectively. The access ratio of assets displays gross inequalities by caste. The Dalits own 12% of the total village assets in Zhapur, 3.4% in Alabujanahalli and 13% in Siresandra. The STs own 4.3% of the total village assets in Zhapur. The analysis of income distribution in the three villages follows the asset pattern of inequality. In Zhapur, the richest 10% of households account for 43% of total income of the village and the poorer 60% hold 23%. In Alabujanahalli, the richest 10% of households account for 38% of income and the poorer 60% hold 28% of the income. Inequality is less severe in Siresandra where the richest 10% of households account for 28% of income and the poorer 60% hold 29% of the income. However, in all three villages, an overwhelming majority of cultivators get only meager returns from crop production, but a few get very large incomes through profit and rents. The share of crop production in total income is 25% in Zhapur, 30% in Alabujanahalli and 24% in Siresandra. Again, Zhapur which is a dry region is most diversified with about 53% of total village income coming from non-farm sector, while it is 42% in Alabujanahalli and 28% in Siresandra. The report shows a severe caste disparity in income distribution. In Zhapur where the per capita income of Dalits is 59% of non-Dalits while tribals 66% of per capita income of non-Dalits. In Alabujanahalli, Dalits earn 50% of what non-Dalits earn and in Siresandra, Dalits earn 47% of what non-Dalits do. The ability to earn income is decided by one’s occupation. In Zhapur, 61% of households among Dalits are engaged in manual labour as against 31% among non-Dalits. Similarly 62 % of households among Dalits are engaged in manual labour against 25% among non-Dalits while the corresponding figures in Siresandra are 31% and 8% respectively. The majority of peasants—small, medium, and rich—and rich capitalist farmers are non-Dalits, classified as backward class (BCs). Not surprisingly, other variables such as education and basic household amenities are also determined by asset ownership. The average educational attainment among landlords and rich peasants is higher than that of poor peasants and manual labourers. For Dalits fall under this category, their position in educational attainment is lower than that of non-Dalits. Like education, class and caste disparity persists in access to basic amenities, too. While basic amenities are still a distant dream in many of these villages, it is elusive for Dalits. The report shows acute deprivation among Dalits in access to basic amenities. In Zhapur, there is no household which has all the amenities surveyed such as pucca house, electricity, drinking water within the homestead and access to lavatory while there is one household in Siresandra which has all the amenities and 28% households in Alabujanahalli thanks to Cauvery irrigation and agrarian surplus in the region. While drivers of deprivation persist, indebtedness has gone up among households in all the three villages. ‘Rural Indebtedness in Karnataka: Findings from Three Village Surveys’ offers a detailed report on source and purpose of debt and their rate of interest. Seventy percent of households are indebted. The informal sector accounts for most of indebtedness except in Alabujanahalli, where the formal sector accounts for 50%. The formal sector accounts for 29% in Zhapur and 34% in Siresandra. The formal loans are largely used by rich farmers from backward castes, naturally who have collaterals—land holdings and a broad asset base. Ninety percent of loans among labourers are informal. The interest rate is implicit and tied to the debt as they lack collateral to avail formal loans. Landlords, peasants and professional moneylenders comprise the ‘informal loan’ sector in all three villages. The model interest rate was as high as 36 %. While the purpose of loans among poor peasants and manual labourers is for consumption, the rich and middle-level peasants borrowed for both production and consumption. While the report, covering a wide range of socio-economic variables, offers a rich analysis of agrarian relations, conditions of farmers, farming and caste-class deprivations in development indicators, it seriously lacks in certain basic aspects. Besides the introductory chapter, the other chapters do not connect to the specific social and political context which would have influenced the variables used in the analysis. The policy and political intervention and caste-class mobilization specific to the region could have been taken into account while analysing these variables. Otherwise what we have is a truncated understanding of the process. The second important aspect is about the caste category. The large scale surveys such as the NSSO offer caste related variables at the macro level; however, they abstract diverse caste groups into broad SCs and OBCs categories. SC or OBC do not refer to a caste. The report uses categories such as the OBC as homogeneous or all non-SCs as OBCs. Caste is relational. They are not a mere collection of identities, and cannot thus be incorporated into such arbitrary administrative categories. Village studies provide a unique opportunity to understand micro processes, and changing caste dynamics. Studies suggest changing the relative position of caste groups and widening intra-caste disparities, which often manifests in the caste protests—the recent examples being the ones by the Jats, Marathas and Patels. Again, in correlation among socio-economic variables, causation becomes tautological—class matters in reproduction of inequality, land or asset ownership decides one’s educational status or well-being or the Dalits are disproportionally concentrated in manual labour as against non-Dalits in land ownership. It would have been fruitful had the report fleshed out these complex relationships taking into account the specificities of the region. Life in these villages is also clearly subject to broad influences and pressures of the region. Otherwise, the report is quite comprehensive and refreshingly unique compared to the recent studies on the agrarian situation in terms of the vastness of data, framework and depth of analysis. The study certainly enhances our understanding of agrarian relation and rural transformation, dominance and deprivation in rural India, Karnataka in particular. A Kalayaiarasan is with the Madras Institute of Developement Studies.